Johannesburg - Sascoc will use more than R7m from its budget to pay Paralympic medallists and their coaches, chief executive Tubby Reddy said on Monday. "We have funds. 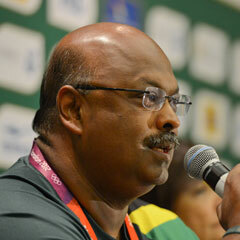 It will come from the Sascoc budget," he said. "Watch national television and you will see them getting their cheques tomorrow [Tuesday] morning." The amount totalled R7.9m, he said. Sports Minister Fikile Mbalula announced on Saturday that Paralympic winners deserved incentives equal to those given to the Olympic stars. "Anything less would be discrimination," he said. Mbalula said they would receive the same heroes' welcome when they landed at OR Tambo International Airport on Tuesday. When the SA Sports Confederation and Olympic Committee (Sascoc) originally announced the incentives in July, it offered Olympic athletes R400 000 for a gold medal, R200 000 for silver and R80 000 for bronze. Paralympic athletes were offered R100 000 for gold, R75 000 for silver, and R40 000 for bronze. At the time, Sascoc president Gideon Sam said that in the Paralympic Games, around 4200 athletes competed for 503 medals, while in the Olympics about 10 500 athletes competed for 300 medals. On Monday, the Inkatha Freedom Party commended the decision to increase the amount. "It was only fair... to take this decision to give the Paralympics winners the same monetary amount.... as they are all equal in representing our country," IFP MP Mkhuleko Hlengwa said in a statement. "There was no real reason from the beginning to reward the Paralympics lesser than their follow athletes who compete in the Olympics".